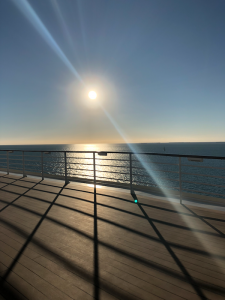 This past November I embarked on a brand-new travel adventure, MY VERY FIRST CRUISE! 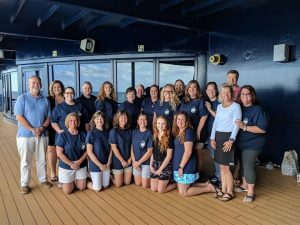 Our 2018 Must Love Travel Agency Event took us aboard the beautiful Celebrity Infinity. This trip was my very first cruise that I had ever been on and it was such an amazing experience! I learned so much about so many new and exciting places that I had never been to before such as the Florida Keys and the Bahamas! 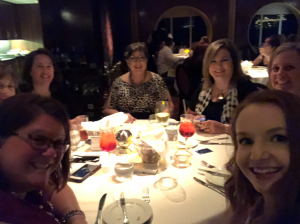 I got to enjoy fellowship and education time with my wonderful colleagues! I also came away from the trip with an in-depth knowledge of cruising! Prior to this first cruise I was filled with so much excitement as well as so many questions. I didn’t know what to expect with this new mode of travel and was so curious as to how it all worked. Like with everything in life, we learn through first-hand experience! 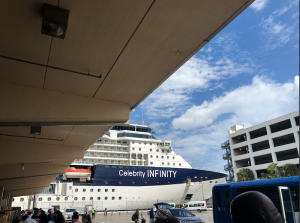 Through my experience onboard the Celebrity Infinity I came away with having all of my cruising questions answered! 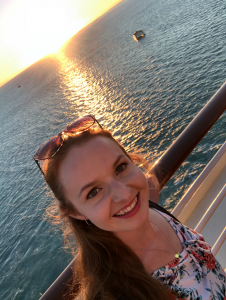 Today I am excited to share with you 7 of the things I learned during my first cruise! I hope that this information and tips help you know what to expect whether you are about to embark on your first cruise or your 100th cruise! Many cruise lines offer a drink package. We all had the option to add one of these drink plans on before our sailing. I opted not to get a drink package, I enjoy indulging in a drink or two but that’s about my limit. For me personally I didn’t feel that I would get my money’s worth out of having a beverage package. I was planning to just pay for any drinks I wanted outright throughout the cruise. When the day came to set sail, I was checking in at the terminal and received such a kind upgrade! The Celebrity crew member at check in saw on my license that I had recently celebrated my 21st birthday and gave me the drink package complimentary. What an amazing start to my first ever cruise! Here was where I had my first learning experience. I feel that I definitely made the most out of having a beverage package. What I was unaware of was the fact that even drinks such as iced tea, coffee, sodas and other fountain drinks are all additional charges. Having a drink package allowed me to get these beverages as well as enjoy some alcoholic beverages. In the end when you crunch the numbers having a drink package definitely will save you money in the long run. It is important to know that every cruise line is different in terms of what beverages are included free and what drinks are an up-charge. 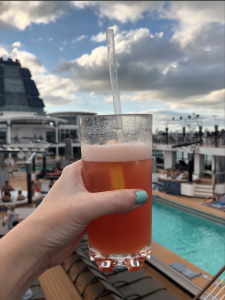 Different cruise lines offer different types of drink packages and many cruise lines even have different tiers of beverage plans. The best way to know which plan is best for you is to talk to your Must Love Travel Planner! Our team has already done the research and can offer you the best advice to save you money and maximize your vacation experience. On a cruise, you will be given your stateroom card, this card does so much more than just open your cabin door. This card is also your form of onboard payment, your ID, and it is loaded up with any credits you may have such as a beverage package. You find yourself using this little card all the time. With that in mind it is a good idea to have a lanyard with a clear pouch to house this card in. This eliminates the need to carry your wallet or bag with you throughout the ship. I saw many people on the ship who had cruise lanyards. I instantly made note that I needed to get one after seeing how useful this item was! The onboard gift shops will sell lanyards; however they are going to up-charge you quite a lot on the ship! I saw lanyards in the gift shop for around $20. That is why my best tip is to plan ahead and purchase your lanyards before you set sail. You can find generic lanyards and even some very cute and stylish lanyards on sites such as Amazon for right around $5. Trust me, this item will be super convenient! Staterooms on a Cruise Ship can be much smaller compared to a standard hotel room. This is just something to be aware of when planning. With proper planning, you will be able to maximize your space to the fullest! Something I encountered was the fact that our stateroom had just one outlet with 2 plugs. Only 2 devices could be plugged in and charging at one time. Once again this was just how it was on our particular ship. Many newer ships come equipped with more outlets and plugs. However, just because you are limited on outlets doesn’t mean you can’t still charge all your devices and gadgets, bring a charger block or a power strip. Devices such as these will allow you to plug multiple device into just one outlet. Another tip I can give is to bring a European adaptor if you have one. Our Stateroom also had a European outlet with two European plugs. This is common on Cruise Ships because they sail all over the world and have passengers from all around the world! Had I brought along a European adapter I could have gained a whole other outlet to use! One of the things I was most curious about prior to my first cruise was how cell phones worked at sea! I ended up being able to use my phone during the entire duration of the cruise with these tips. I put my phone in airplane mode to make sure I would not get roaming charges. Be aware of the fact that your phone may still work out at sea but you might get hit with extremely high roaming charges. I recommend talking to your cell phone service carrier prior to your sailing to know your range. Even in airplane mode I was able to still call and text with people back on land because I enabled wifi calls and texts. This is a feature that most smart phones have that you can use wifi to call, text and even facetime! I purchased the ships wifi package in order to do this and found that the onboard wifi was very strong and I always got a great connection. If you are wanting to use your phone in port in a different country I would also recommend talking to your service provider before your sailing telling them where you are traveling so you can find out if you can get service. My cell phone company offers a great program where I can pay for an international plan per day. I was able to utilize this during our day in port in Nassau Bahamas. As a first-time cruiser, motion sickness was a fear in the back of my mind. I am happy to report I was absolutely fine during our sailing and never felt any motion sickness symptoms. My best advice to you if you are concerned with motion sickness is to just be prepared. I picked up motion sickness pills prior to sailing to keep with me as a precaution. I also bought a product called “Sea Bands.” These are bands that go around your wrist and apply pressure on certain pressure points that are supposed to naturally reduce the feelings of motion sickness. The first night of our sailing we were just getting out to sea and in this area the water was a bit choppier. I was noticing the motion more so choose to put these band on as a precaution. I felt great the entire night so I definitely think this product works wonderfully! The evening before you disembark you may be instructed to place your luggage outside of your stateroom to be collected by your host. They take your bags away so that the next day they can handle getting the luggage off the ship for you. Every cruise line has different procedures but this is definitely helpful. The morning you depart you don’t have to worry about maneuvering your luggage all around the ship! It is a great system; however, this is just something that you need to be aware of so you can plan ahead. Know that on your final evening of the cruise you will have to gather from your luggage any items that you need for that evening or for the next morning. I just had my backpack with me and I definitely had to do a lot of consolidating and reorganizing to get my essentials to fit in my small carry-on. I made it work but in the future I would definitely plan to bring along a packable tote bag that can be used for this exact purpose. With a packable tote, you can repack just those essentials for that night and the next day and not have to worry about not having enough bag space. Plan with Your Must Love Travel Planner! My first Cruise experience definitely gave me the cruising bug! I saw that there is so much to do and see during a cruise vacation! You are onboard a floating luxury hotel that is whisking you away to new and exciting destinations! A cruise is multiple vacations inside a vacation! You can make your cruise relaxing, adventurous or a perfect mixture of both! There are so many options to choose from when it comes to activities to experience on the ship, to excursions you can take in port! With this in mind it is important to go into your cruise vacation with a plan and a knowledge of all of your choices so that you can guarantee you won’t miss out on anything that you really want to do. This prior research will allow you to make the most out of your vacation! The best way to do this is by contacting your Must Love Travel Planner! Our team can use their knowledge and experience to give you recommendations and tips that will enable you to get the most from your vacation! Your job is to relax and enjoy while we do the work part for you! 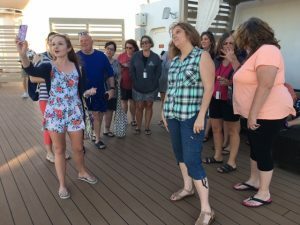 I hope these 7 things I learned on my first cruise will answer some of your questions about cruising. I highly recommend planning a cruise vacation. I am already counting down the days until I get to set sail again! If you still have questions about a cruise, know that your Must Love Travel Planner will be your advocate and answer any questions you may have! As always, our team at Must Love Travel is happy to help you plan your next vacation! Happy Cruising! 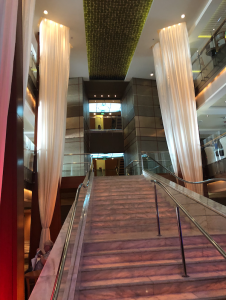 This entry was posted in Celebrity Cruise Line, Cruise News, Cruises, Travel Planning, Travel Tips, Vacation Destinations, Video and tagged cruise, cruise tips, first time cruiser, Must Love Travel, packing tips, Travel, travel tips, vacation on April 4, 2019 by Megan Przychodzien.